Have you ever had grilled bacon? If not, you are so missing out. I love bacon any way you prepare it, but once we started grilling it, I can’t make it any other way. When you think about how to cook bacon, it may not have even occurred to you that you can try cooking bacon on the grill. In fact, we discovered it when we actually did this by accident one night. I didn’t want to mess up the kitchen, and we were already grilling burgers outside. 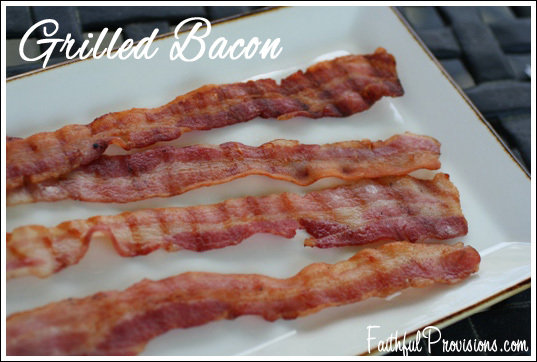 What we found was that cooking bacon on the grill has multiple benefits! Tastes Better – Bacon on the grill has that nice, smoky grill taste. It really adds to the flavor. No Leftover Grease – Unlike cooking bacon in a pan, I don’t have to figure out what to do with the hot bacon grease before I clean up. 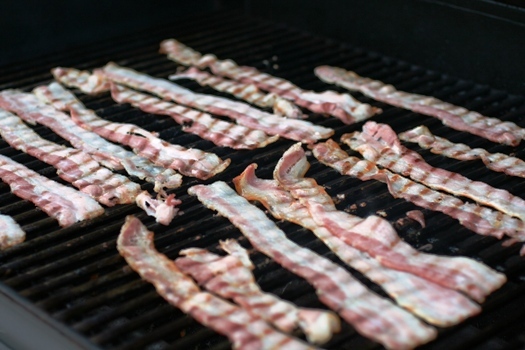 No Curling – It’s much easier to put grilled bacon on sandwiches or over meats as a topper because your end result from cooking bacon on the grill is nice, straight pieces, with no curling. Take the entire package of bacon and drop it in the center or side of the grill on medium heat. With a pair of tongs, slowly and carefully separate the bacon and lay each piece out individually on the grill surface. Grill for about 6-7 minutes per side. *COOKS NOTE: If you prefer crispier bacon, cook on medium-high heat for about 5-6 minutes per side. With a pair of tongs, slowly and carefully separate the bacon and lay each piece out individually on the grill surface. Grill for about 6-7 minutes per side. *COOKS NOTE: If you prefer crispier bacon, cook on medium-high heat for about 5-6 minutes per side. Does the grease not sit in the bottom of the grill which would be a nightmare to clean? My bacon ignited from the dripping grease and incinerated. When I checked it after a few short minutes, most of it had turned to ash – the rest was on fire. How do you keep the dripping grease from catching fire? Wow! I have been grilling bacon for a while, and never had that happen — I am so sorry! It sounds like to me you might need to clean your grill. Whether you cook bacon or not, you would want to keep the drip pan and grates clean for safety reasons. Yep, $4 of bacon up in ash as the grease dripped down and started a bonfire. Did some research and on to package number two. Bacon grease will catch on fire like gas to a flame. There are two methods that I’ve found that work. Method One: The aluminum foil method. Make sure you take your foil and turn up the edges to catch the bacon grease so as not to cause flame bursts, lay out your bacon on the foil and cook it much as you would in a pan. Yes, the bacon cooks in it’s own grease so this is not the healthy method, but on the bright side you can grill up that burger or leftover ham in the grease and yum yum yum! Method Two (the one I personally use), I have a two burner grill, so I turn off one side and cook on that side. 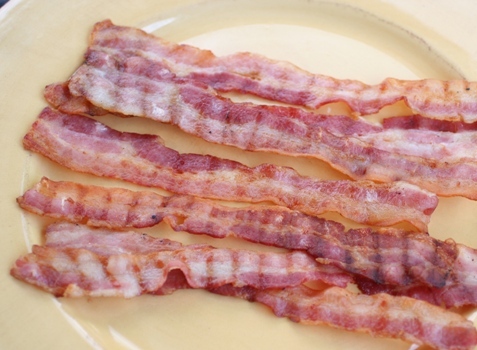 The heat from the opposite burner cooks the bacon and the grease drops, so as not to cook it in it’s own grease, and the flare ups from the grease (if they happen) occur on the side that your not cooking on, in other words your bacon is safe from turning to ash. gonna catch fire. I’ll let you know what happens….. I found a non stick aluminum foil that works great! 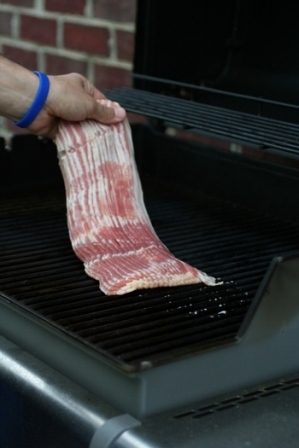 The bacon does not stick to it and makes flipping it a breeze. Just use a double layer of foil to prevent accidental puncture with the sides curled up so the grease does not drip and catch fire.